The spherical stellarator idea has an appeal similar to the spherical version of the tokamak with apparent higher temperatures and better confinement along with cost savings that could create a workable fusion energy solution. 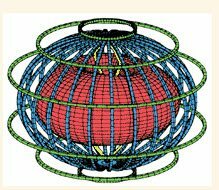 As mentioned in the information on stellarators there are general advantages in this particular magnetic fusion design and it was the one the USA pursued early in the race for attaining sustained nuclear fusion. 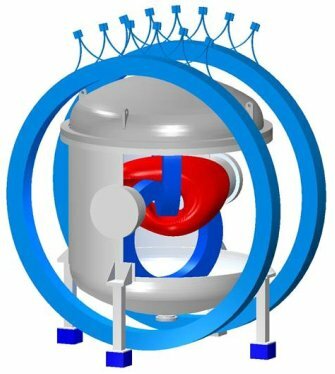 Unable to obtain the temperatures necessary for effective fusion many of their programs changed to follow the better results of the Russian-perfected tokamak design. 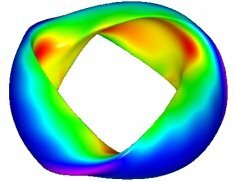 In more recent years there has been further exploration of the stellarator approach. Mainly this has arisen from some inherent benefits of the stellarator idea including the lack of the need to develop a plasma current which can allow for a more stable plasma formation. To induce a plasma current in the tokamak it has a central solenoid coil fed via a transformer. This requires the central portion of the tokamak to have a significant diameter. As mentioned in the information on the spherical form of the tokamak, there have been developments which have allowed this to be reduced. The power requirements to drive the central solenoid are very high. Each generated plasma is relatively short in life. 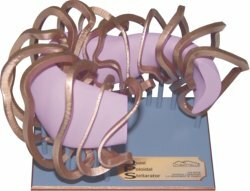 A stellarator-type one has the potential to enter a long steady state. With the stellarator not requiring central induction the core diameter can be built significantly smaller. 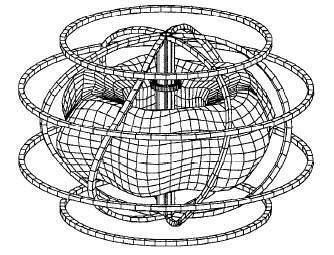 The spherical stellarator should be fairly straightforward to design. Again with the spherical format the costs for construction of the unit should be significantly less than the regular unit. As well as this there are advantages in being able to increase the pressure, with fusion generation related to the square of the pressure within the plasma. Dr Paul Moroz published a number of articles in 1996 to 1998 while he had funding from the Office of Fusion Energy Sciences within the US DOE (Department of Energy). His designs from the papers presented at this time started with some more angled toroidal coils with a few external poloidal ones that preserved or increased stability. In modern larger form stellarators the coils tend to have a rather tortuous shape to allow for a combination of toroidal and poloidal influences. By 1998 Paul's designs had more straight vertical toroidal coils, continued external poloidal ones and the intention to allow a bootstrap - plasma - current, which many larger stellarators sought to negate to maintain generated plasma stability. 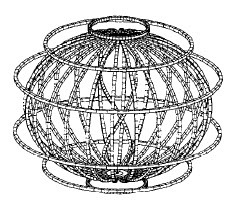 This later design incorporates a helical central coil, though, which produces the well-known undulating surface of a stellarator plasma at the core. The spherical stellarator, by assuming a smaller overall size and especially a smaller central diameter, allows the generated plasma to have a much larger volume to surface area. As the surface area will be cooler than the core, the greater the internal volume, the higher the general temperature of the plasma can be. Smaller sized units allow a significant reduction in the number of coils required for the design. The various programs that have arisen from the idea have variations on the theme. 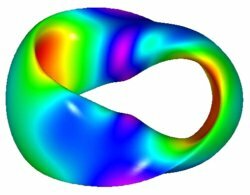 With bootstrap currents and other varying design aspects being incorporated, the lines of distinction between the various magnetic confinement ideas are becoming increasingly blurred. 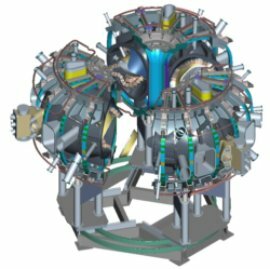 Princeton Plasma Physics Laboratory started their own program - the National Compact Stellarator Experiment - NCSX around the same time they were running their NSTX - the National Spherical Torus Experiment, hoping for the benefits expected from the spherical stellarator design. Construction costs for the NCSX were increasing year by year. In 2008 the DOE decided the cost over-runs were unsustainable. Extra funding funneled into this project could reduce funding available for other options including the NSTX. Although the NCSX was around 50% built further funding was terminated and construction on the unit stopped. Information on the progress was to be well documented on the chance this avenue might be pursued again. But the DOE felt there was a better chance of the NSTX producing more immediate results. 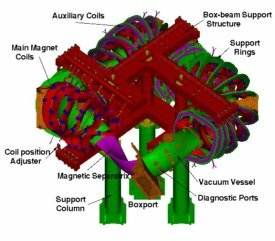 The QPS - Quasi Poloidal Stellarator - initiative is the design of the project from Oak Ridge National Laboratory in Tennessee. Originally founded in 1943 to support the Manhattan Project it works in association with the University of Tennessee and the Batelle Memorial Institute. 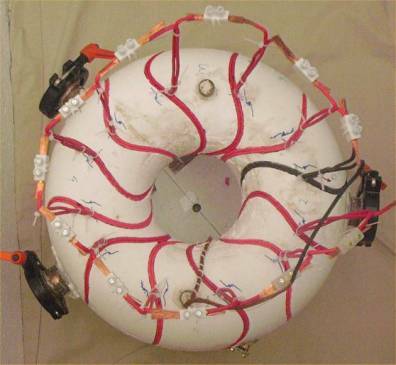 Features of QPS are similar to those found in modern large stellarator designs with the 3D toroidal coils. At Auburn Fusion Lab - Auburn University, Alabama, another unit the Compact Toriodal Hybrid - CTH - has been in development. Again it is a small unit with a low aspect ratio of larger to smaller radii allowing for a relatively large plasma volume. It has helically, toroidally and poloidally-wound coils with a some of the latter having an ohmic heating function for the plasma. The Helically Symmetric eXperiment (HSX) at the University of Wisconsin aims to produce a very stable plasma with no plasma current. It has a major radius for the plasma of 1.2 meters, an average minor radius of 0.15 meters and a plasma volume of 0.44 cubic meters. 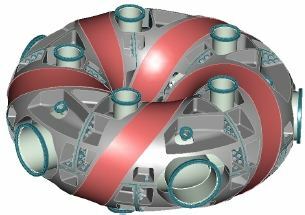 At UC San Diego the Aries C-S Program compact stellarator has been developed (image related to this shown at top of page), while in New York the Columbia Non-Neutral Torus (CNT) has been built at Columbia University. This unique design involves two coils within the vacuum chamber angled to each other inducing a plasma to form between the two. Coils external to the vacuum chamber enhance stability. In the planning stage for building expected to begin in 2016 is the French compact stellarator, the ESTELL, standing for the Evolutive STELlarator of Lorraine. 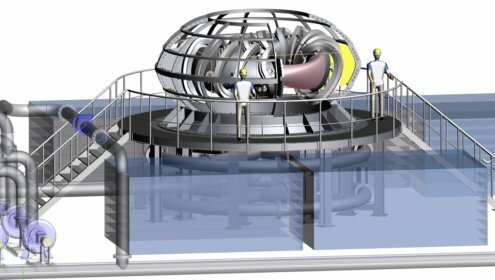 With an outer radius of 1.4m, an inner one of 0.28m, a plasma volume 3 cubic meters and 20 modular coils, it is expected to cost €13 million. Of great interest in this field is the effort of a Spanish fusion scientist, Vincente Queral, who built a working spherical stellarator for €2,700 in materials! Initially considering the tokamak design for his construction he discarded it due to the very high energy needed to power it and the relatively short pulses of effective plasma it would generate. 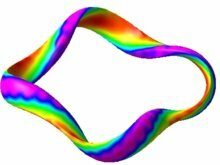 The UST-1 - Ultra Small Torus, which is really an ultra low-cost stellarator - was inspired by the Wendelstein designs, but at the massively smaller size of a 119.2mm (about 4.7 inches) major radius and 21mm lesser radius, with a plasma volume of 1.1L. He assembled his spherical stellarator from 2005 to 2006 and tested from 2006 to 2007. Currently his is working on the UST-2 which he began in 2008. 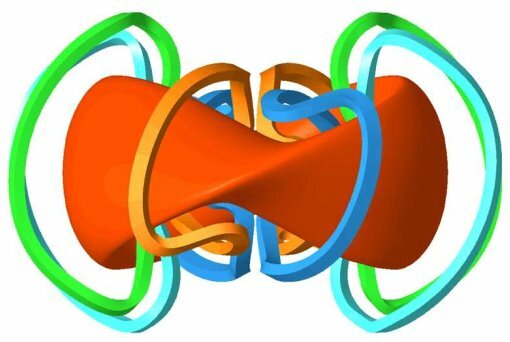 The spherical stellarator design offers another approach to magnetic confinement in the search for nuclear fusion alternative energy. If it works, with lower construction costs and a more compact design it could be an appealing world-wide solution.